Euphoniums no longer resting on laps, etc. Now exhale and put the air back on the target. Mindfulness of fundamentals is essential to excellent brass playing. The approach outlined here is intended to put those fundamentals in a useful context that promotes efficient, easy playing. Brass playing is full of constants and variables. As players, the more constants we can establish, the more we diminish the impact of variables. Finally, the ideas contained here also work beautifully as a daily reminder of what matters personally, an important consideration so that music is always being made from a positive happy place. Great brass playing is a lifelong pursuit. A well-established set of fundamentals that can be enhanced through knowledge and experience is absolutely crucial. Ultimately, our goal is to take a big breath and make a beautiful sound. Having the foundation on which to build such an easy approach can make all the difference, and allow for meaningful musical experiences. Dr. William Stowman is Professor of Trumpet at Messiah College in Mechanicsburg, Pennsylvania. 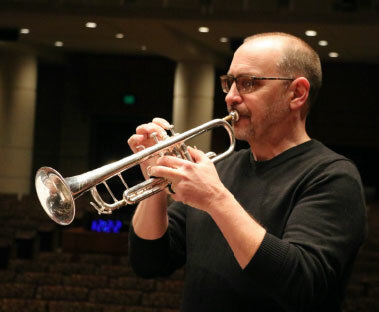 He holds the DMA from The University of North Texas and has performed and recorded with the North Texas Wind Symphony, BrassCross, The Keystone Wind Ensemble, and Tromba Mundi. He has two solo recordings to his credit; A Matter of Seconds (MarkCustom), and A Timeless Place (Klavier). Dr. Stowman performs on Shires Trumpets, and mouthpieces by Pickett Brass. His new book “Body, Center, Breathe, and Flow: The Artistry of Teaching, and the Teaching of Artistry” is in process for a 2020 release.